Since 2006, cell reprogramming and generation of induced Pluripotent Stem (iPS) cells has opened up outstanding opportunities for Stem cell research and drug discovery programs for personalized medicine. This is due to the fact that these methods bring Life Scientists an almost continuous and inexhaustible source of cells from targeted somatic (healthy or diseased) cells (1, 4). For therapeutical perspectives, there is a strong need to improve cell reprogramming efficiency but also safety by limiting the risks linked to genome integrity (ex. use onf C-MYC and KFL4 oncogenes), alterations of intracellular pathways (ex. p53) that might lead to cancer phenotypes and apoptosis… In addition, conventional reprogramming viral procedures are long (several weeks) and relatively unefficient (<0.001%). 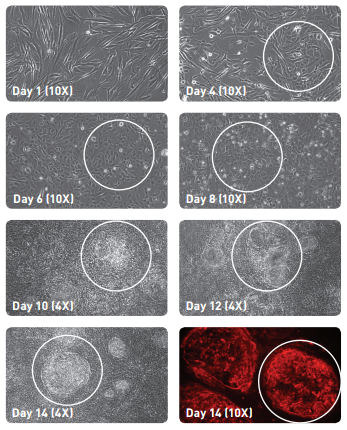 Phase-contrast images of iPS morphology colony changes throughout Stemgent’s reprogramming (TRA-1-60 pluripotency marker). Recent discoveries aim at controlling cellular fate with more flexible approaches such as transdifferentiation, dedifferentiation, transdetermination, direct cell conversion or reprogramming (eg.Cardiomycyte-like cells; 14-15). Chemically induced pluripotentStem Cells (CiPCs) have also been described (16) (see my previous post “Bioactive small molecules make exogenous reprogamming genes dispensable“). Recently, iPS cells pre-engineered with modern genome editing technologies (TALEN, CRISPR) have been published (17; Xcell Science). These cellular models can mimick CNS disorders in vitro (eg. Alzheimer’s disease (AD), Parkinson’s disease (PD), Autism, Schizophrenia, and Amyotrophic Lateral Sclerosis (ALS); see the previous post by Jean-François (Isogenic Knockout iPSC Lines for Modeling of CNS Disorders). Characterization of XCell isogenic iPSC gene specific KO lines (PARK7). Interestlingly, the role for microRNAs in the maintenance and retention of pluripotency for both embryonic stem (ES) cells and iPS cells have been demonstrated (18, 19). Miyoshi et al. showed that the delivery of specific µRNA combinations functionally reprogram human fibroblasts to a pluripotent state without exogenous reprogramming factor expression (20). A new microRNA-enhanced mRNA reprogramming method generating high-quality human iPS cell lines and eliminating conventional feeder co-culture during the reprogramming process, is now commercially available through Stemgent-Asterand and tebu-bio. As far as using cocktails of small molecules in cell reprogramming, Ichida et al. 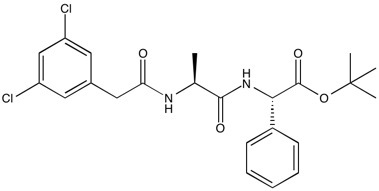 recently demonstrated that the inhibition of the NOTCH pathway of mouse and human keratinocytes by the inhibitor DAPT (eg. DAPT by Focus Biomolecules) make possible to routinely produce iPS cells without the use of C-MYC and KFL4 oncogenes. These C-MYC and KFL4-free iPS cells have intact p53 activity for a better genomic integrity and safer iPS cells (21). HIP Neural Stem Cells generating all the native brain cell types (neurons, astrocytes…). Which cell reprogramming strategies have you found very promising? Your input about protocols aimed at safer, faster and efficient cell reprogramming strategies are welcome. Share your experience, discoveries or thoughts in the “comment section” below! Looking to share ideas, protocols or to establish collaborations in relation with Stem Cells & Cell Reprogramming? Join the S2CR: Stem Cell & Cell Reprogramming Network LinkedIn community!